London Fashion Week always provides me with plenty of fashionable food for thought and this year I have come away with a renewed belief that designer collections are 100% worth investing in. However, this season I noted that the way in which fashion editors are wearing designer has changed; instead of investing in timeless classics (trench coats etc) they are buying brilliantly bold statement pieces to 'fashion-up' high-street basics. With this new shopping mantra in mind, I've compiled my edit from online designer e-boutique Avenue 32 of SS13 designer pieces that will shout in your outfit. Avenue 32 stock a plethora of designer brands from well known labels like uber-designer Phillip Lim to under-the-radar collections like the super cool No.21. Take Mother of Pearl's floral/stripe print culottes for example (3. ), an out-there style for sure, but they looked fabulous on one fashion ed on Somerset House's cobbles teamed with a classic camel coat and black court shoes. 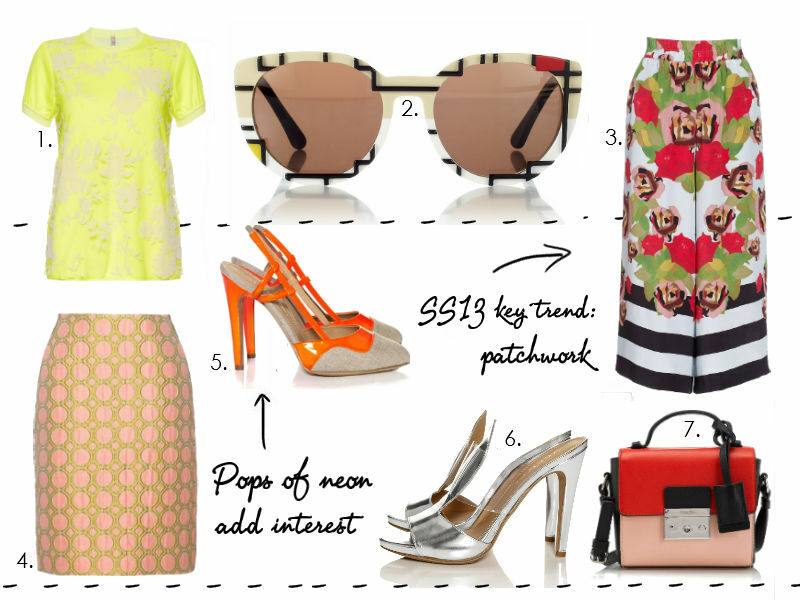 Likewise you can't go wrong with a pop of designer neon; Antonio Marras' floral tee (1.) and Aperlai's fluro-detail slingbacks (5.) are unlike anything I have seen on the high street. Remember to invest in making a statement and you can't go wrong. 1. Neon yellow floral tee, Antonio Marras, £230. 2. Mondrian shades, Cutler & Gross, £365. 3. Pink rent printed culottes, Mother of Pearl, £395. 4. Pink spot jacquard skirt, Mantu, £345. 5. Fluro Annie slingbacks, Aperlai, £430. 6. Silver Marilyn heels, Aperlai, £485. 7. Persimmon cross body colourblock satchel, Calvin Klein, £605. LFF's day two of London Fashion Week was more of a relaxed affair; continue reading after the jump for a sneak preview of the Mawi AW13 collection, The Carlotta Actis Barone Fashion Scout show and to hear about my trip to the The Apartment- a creative hub for fashion bloggers during London Fashion Week. 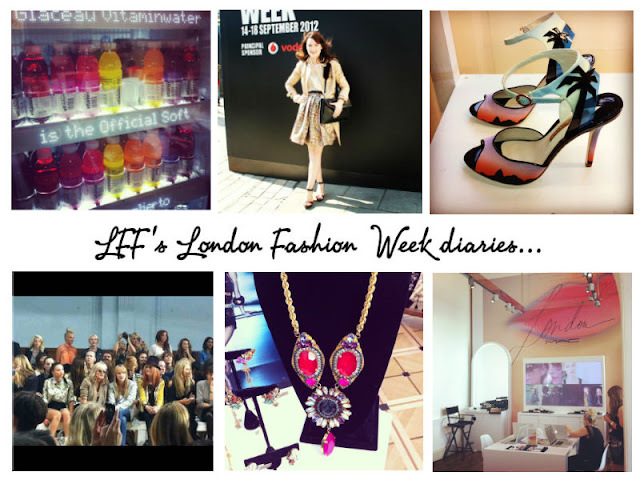 Featuring the Zoe Jordan, Bora Aksu, Fyodor Golan and Jena Theo AW13 shows, an LFF outfit and Mark Francis from Made in Chelsea, continue reading after the jump to see LFF's day 1 at London Fashion Week. Picture by Katie from Glass of Fashion. London Fashion Week kicks off today and I'm very excited to be taking LFF to the AW13 shows again. If you would like a behind the scenes peak of what it's like to be an independent blogger at London Fashion Week (I'll show you both the glamorous and unglamorous truth), be sure to follow me on Twitter, Instagram and Facebook for all the of-the-moment updates. I will also be sharing my daily photo blogs on here like last season, but as there isn't always time to post on the day, head to my social media accounts for the hour-by-hour updates. To give you a taster of what you can expect, here's a montage of my favourite Instagram pictures from September's fashion week.. and if you are attending the shows come up and say hi! It's always great to catch up with blogger friends at the shows, old and new. Top row L-R: 1. Vitamin water in the press lounge, an essential part of the LFW experience! 2. Yours truly on the Somerset House cobbles. 3. Crazy hot shoes in the Topshop Newgen showroom by Sophia Webster. Bottom row L-R: 1. The FROW at Sass & Bide 2. Erikson Beamon jewels in the LFW showrooms. 3. The MAC beauty bar in the press lounge. 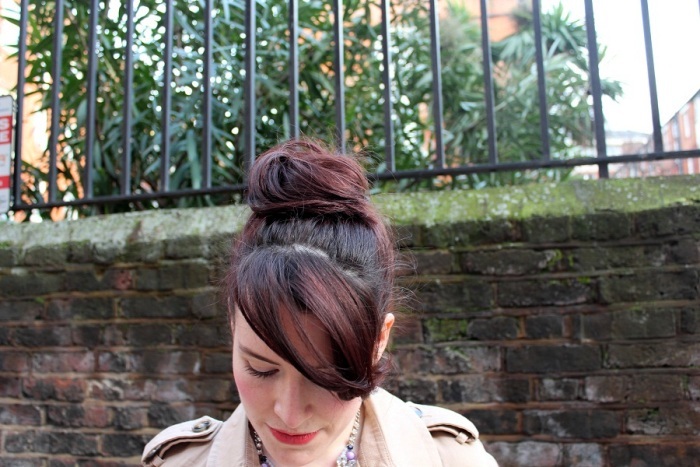 One of my favourite stores on the high street right now is New Look. In the past few months my NL purchases have included my winter coat- a classic navy tailored boyfriend number, the perfect white cotton shirt (I bought 4...) and a pair of inky blue wedge trainers that often get mistaken for an Ash pair. No doubt I will parting with more of my pennies in New Look over the coming months looking at their fabulous SS13 collection. I've compiled my new-season 'Wishlist' here, putting together two looks using some of the stand-out styles currently available online. 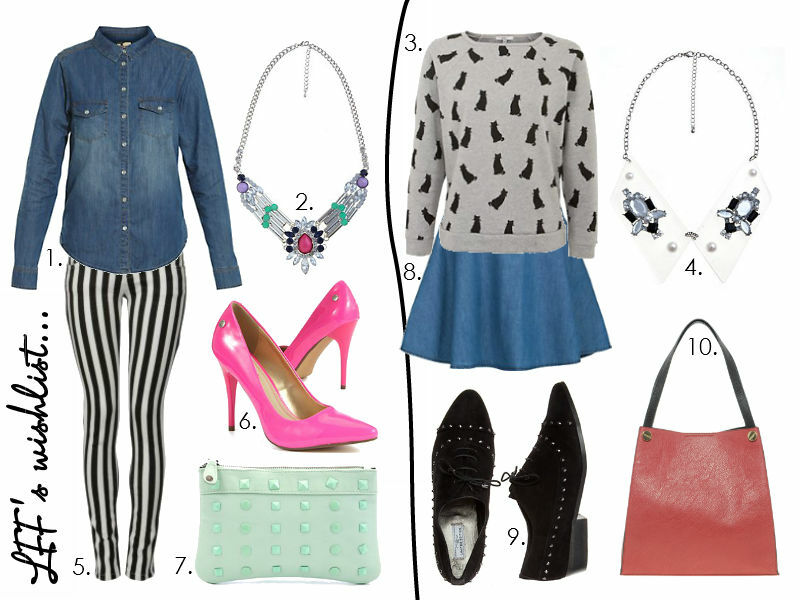 For my first look, I've dressed up a classic denim shirt with stripe jeans (perfect for the SS13 monochrome trend), colourful jewels and a pastel clutch bag. This is the sort of outfit I'd wear for post-work cocktails in a trendy London bar. Look number two is a playful weekend ensemble featuring a super-cute cat print sweater that I may just have to add to my growing wardrobe of New Look clothing! I've pared the sweater with a denim skater skirt and brogues for a youthful look, but I would also wear the sweater with jeans and a white blouse for an easy 9-5 outfit. 1. Navy popper front shirt, £16.99. 2. Limited mult-stone necklace, £12.99. 3. Grey cat print sweater, £14.99. 4. Monochrome perspex collar, £7.99. 5. Parisian black stripe skinny jeans, £24.99. 6. Blink neon pink pointed court, £34.99. 7. Pieces mint green clutch bag, £13.99. 8. Mid blue denim skater skirt, £14.99. 9. Limited black sueded studded brogues, £34.99. 10. Structured wing tote, £14.99. This post was intially meant to be a standard LFF Six of the best: post, but as is often the way with shoes, I got carried away during my edit and ended up featuring eight. Unfortunately 'Eight of the best:' doesn't have quite the same ring to it does it? 1. Sophia Webster Yayoi sandals, Net-a-porter.com, £525. 2. 'Priority' pointed high heels, ASOS, £45. 3. Nicholas Kirkwood neon printed pumps, Net-a-porter.com, £445. 4. Dune Benefit striped courts, ASOS, £80. 5. 'Pivotal' wedges, ASOS, £45. 6. Jimmy Choo Anouk metallic pumps, Net-a-porter.com, £595. 7. 'Hometown' heeled sandals, ASOS, £40. 8. Gianvito Rossi metallic & PVC pumps, Net-a-porter.com, £430.